Every year my chiropractor, Dr. Ed of Total Body Health Care, does a supply drive. We are always so blessed by the drive & how much it helps our art programs!! 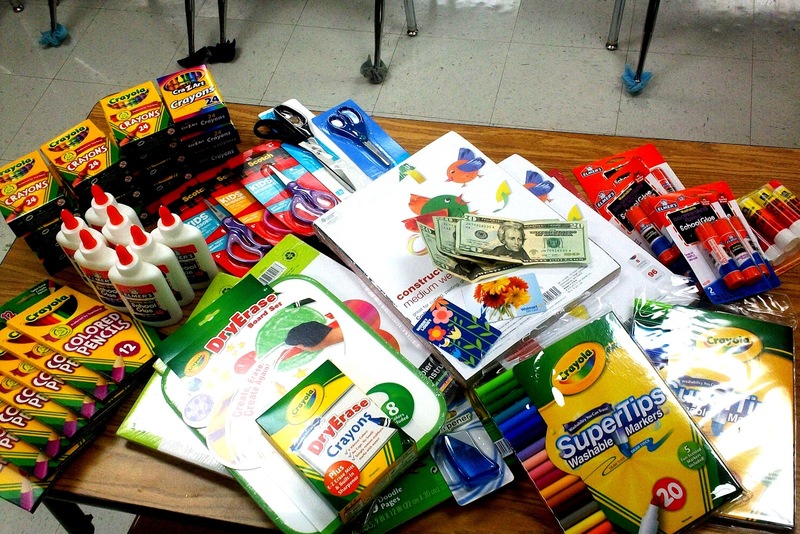 The supplies are divided between my school as well as my friend Julie's ( http://artchattermatters.blogspot.com ). The past few years people have been giving more money/gift cards...which is AWESOME! This really does allow my budget to stretch farther...and get me through till I can order(which is usually in Nov/Dec). THANK YOU DR. ED & ALL THE PEOPLE THAT BROUGHT IN SUPPLIES!!! He has recently moved locations, and I have not found the new information online...if you are in the Hermitage/Nashville,TN area...and would like more information...please contact me! You have a very kind Chiropractor, Ted! What a blessing! And thanks again for the tip about the 25 cent school boxes at Wally World. I thinkI walked out of there with at least 50!